Car ownership maintenance and repairs go hand-in-hand. While it’s not something we want to think of when we’re buying a new or used car, it’s the responsibility that comes with the reality of ownership. No car lasts forever, but if you’re planning to keep yours for a long time, you can definitely expect some repairs to arise from routine wear. That said, not all repairs are the same. Some are quick, easy and less expensive–like changing your battery or a fixing a flat. Some, not so much. More significant issues such as a seized engine, can really hit your pocketbook and potentially write-off your car. 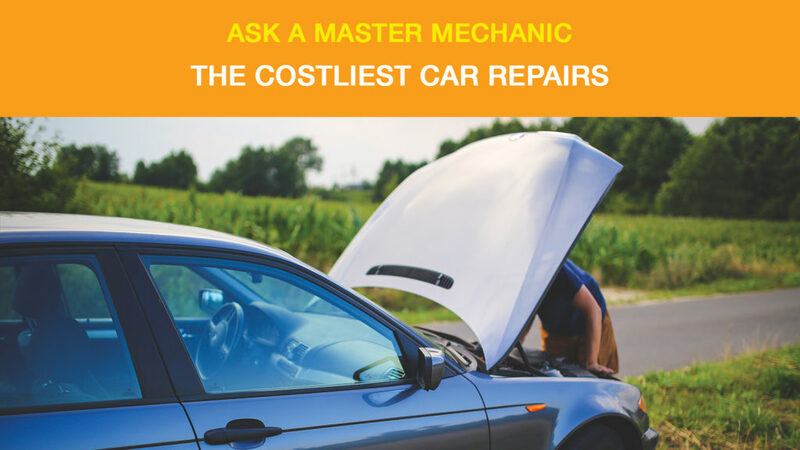 We talked to a Master Mechanic to find out what the costliest car repairs are and how they can be avoided. A head gasket seals the high pressures produced inside your engine cylinders. It also prevents coolant and oil from leaking into other areas. If your head gasket fails, high pressures , coolant and oil can end up mixing causing extensive engine damage. It can also cause your engine to overheat and you may find yourself stranded on the side of the road. While head gasket kits cost a few hundred dollars, replacing them is labour intensive and will run up the cost of the final bill. Like most problems, the best way to avoid this issue is with preventative maintenance. While driving, monitor your engine and make sure it doesn’t overheat. Overheating is the most common cause of head gasket failure because it can cause them to warp from the high heat and pressure. Your suspension consists of shocks, springs, struts, rods, and control arms to help your vehicle absorb uneven roads. Over time, the many parts of your suspension can wear out. While not expensive to maintain, a complete suspension overhaul will cost quite a bit of money. To avoid replacing the entire suspension, keep a close eye on how your car is driving. If it pulls to one side when driving, feels bumpier than usual, or you notice any irregularities, bring it into your local Master Mechanic ASAP. If your transmission fails, you’ll know. Mostly because your car won’t drive. Your transmission is one of the most essential systems in your car. It’s the most critical component between the engine and the wheels. Transmission issues may have some telltale symptoms. If you notice slipping clutch, an increased engine rpm’s, a “burning” smell, or new noises, you should bring your car in. If you’re unsure about the health of your transmission, it’s always best to have it looked at by your local Master Mechanic. Whether you’re into cars or not, you probably know that a critical engine failure isn’t a good thing. It’s well-known as the most expensive car repair, perhaps because the engine is known as the most critical part. Internal engine component damage in most cases is avoidable if caught in time. In some cases, the cost of replacing your engine makes it more practical to replace your car. Not surprisingly, your engine probably won’t fail out of the blue. Most issues arise from not performing routine maintenance on your vehicle. If you’re not performing regular oil changes, ignore leaks, or fail to maintain your cooling system, you are putting your engine at risk of failing. Bringing your vehicle to your local Master Mechanic is the best way to stay on top of the routine maintenance required to keep your engine running smoothly. Call Your Local Master Mechanic! If you think something’s wrong with your car or just want to perform routine maintenance, we’re here to help. Contact your local Master Mechanic today to book an appointment.